The combined Salisbury West and Mt Korong Landcare Groups Farming for Sustainable Soils project is in its second year of trials funded through the Federal Governments Caring for Our Country funding. The groups have been busy with the project, addressing a variety of issues with ground cover maintenance, stubble retention, shelterbelts and soil tests. Two paddock walks have been held to examine the pasture varietal site at Salisbury West, one of half a dozen paddock scale demonstration sites. 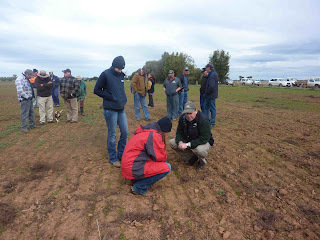 Late in August a crop walk was conducted from Powlett to Korong Vale, discussing yield prediction, crop nutrient requirements, stubble retention and moisture retention in trial paddocks. “Green Haystacks” are managed for grazing while providing shelter and biodiversity across the landscape. These salt bushes, acacias and trees are planted in fenced blocks turning unproductive land into grazing opportunities for sheep. 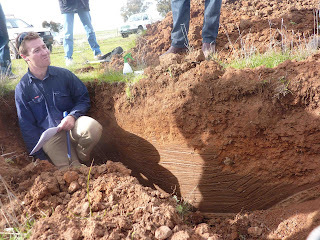 Ongoing independent soil tests have identified the need for remediation techniques trials in 2013 on all soil types in order to address hard panning and anaerobic soils. For more information on the Farming for Sustainable Soils project, contact the Facilitator Jean McClymont, ph: 03 5437 3281 or email: bjmccly@activ8.net.au.